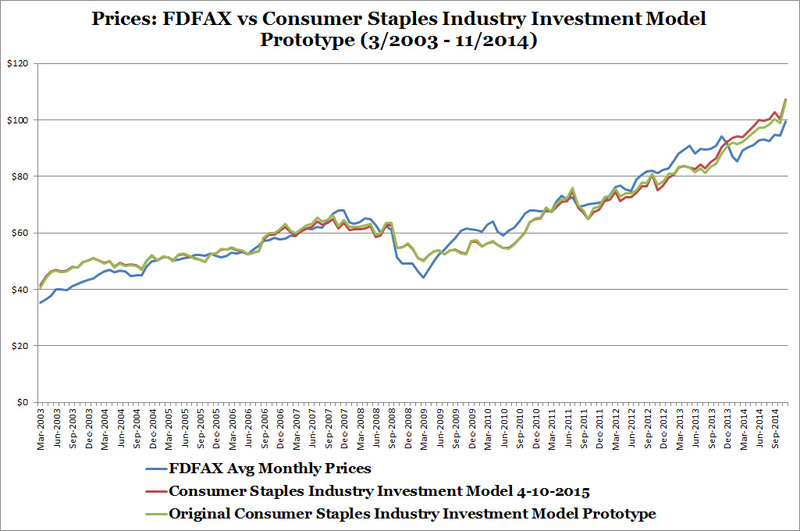 2/18//2017 - The primary driver for the Consumer Staples Industry Investment Model is US wholesaler trade figures and investor sentiment. Investors are currently hiding from global economic uncertainty - Oil and Commodities Crash, weakening Chinese economic conditions, Brexit, and rising interest rates I expect future consumer staples performance to outperform the general stock market. In terms of other relevant data, the Michigan's Consumer Sentiment Index preliminary reading for February is 95.7 which is equivalent to the 2005 - 2007 average of 86.7. The NRF states that retail sales will grow by 3.4% in 2016, they haven't published a projection for 2017. I use the 3.4% 2016 growth rate. 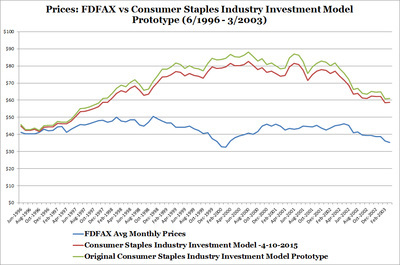 Finally, I'm in the process of developing a Stock Market Investment Model which will help estimate stock market performance for the Consumer Staples Industry Investment Model. Consumer staples are essential consumer products such as food, beverages, personal products (toothpaste, shampoo, medicine), paper products, and etc. 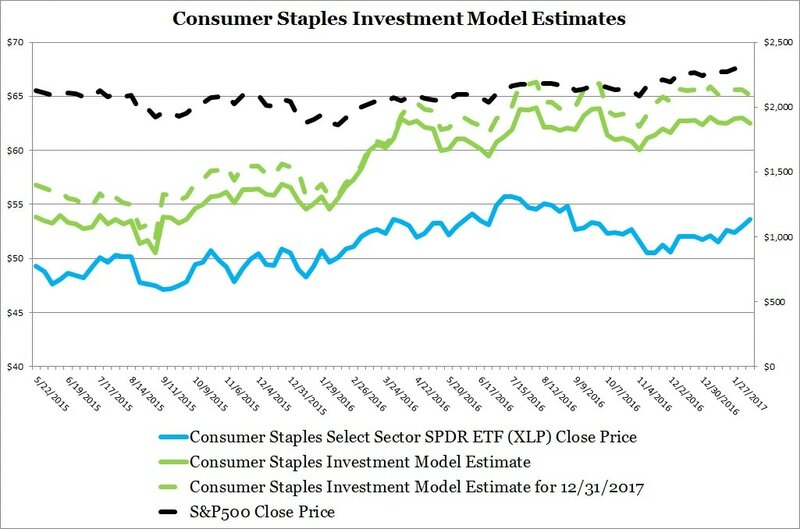 The Consumer Staples Industry Investment Model estimates the price of the Consumer Staples Select Sector SPDR ETF (XLP) which is an index fund that holds consumer staples retailers in the S&P 500 Index. 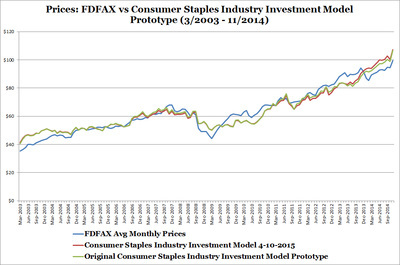 Household names such as Walmart, Walgreens, and Pepsi comprise a large part of the index. 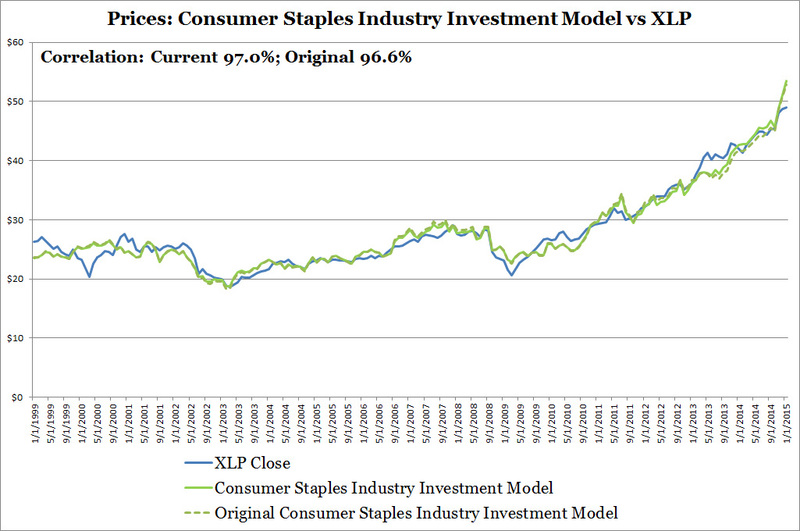 The model will help the general investing public make informed investment decision primarily with the Consumer Staples Select Sector SPDR ETF (XLP) and secondarily with the consumer staples industry and member stocks. Look into significant misses in the late 1990s and early/mid 2000s. Review historical merchant wholesaler inventory data to see if there is a better fit. 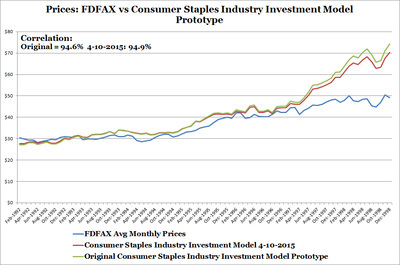 Find a better way to forecast merchant wholesaler inventory data. 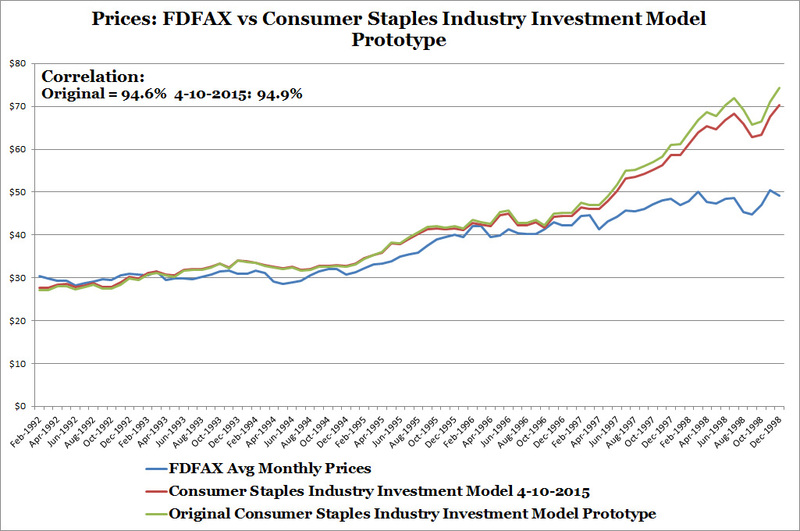 Consumer Staples Industry Investment Model 4-10-2015 is another name for the current model using revised merchant wholesaler data. 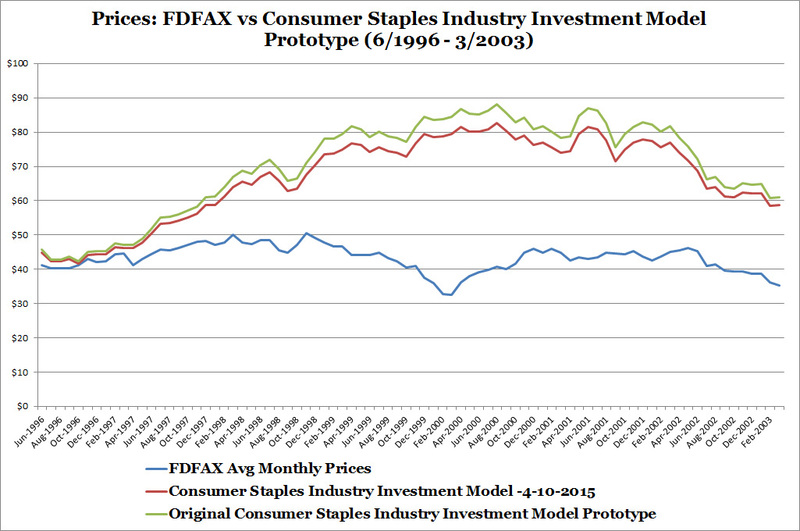 The three charts highlight that in all periods, besides the dot com era, both the Consumer Staples Industry Investment Model 4-10-2015 and original model provides reasonable estimates of the Fidelity Select Consumer Staples Portfolio (FDFAX). For more details and discussion on the original model backtesting results, please see links below for my prior blog postings.